Why the wait? My pattern for this original design is published in this month’s issue of The Quilt Pattern Magazine! I designed this quilt using 9″ blocks for The Main Street Strippers Quilt Club at Heritage Fine Fabric in Belton, Missouri to use for their 2008 raffle quilt. The quilt finished at 88″ x 105″ which is bigger than I wanted. So, I scaled the blocks down to 6″ and made myself a smaller quilt. My top was finished in April 2009, but then it sat waiting for quilting inspiration and skills to develop. In September 2013 I joined the quiltdesigners list and less than a week later a call went out from TQPM for projects for upcoming issues. What a luck! I sent in a photo of my top and they said they wanted to publish the pattern. Eck! I had the instructions for the blocks and sashing — written at 9″, so I madly started revising and completing my instructions. Then I needed to test the pattern. 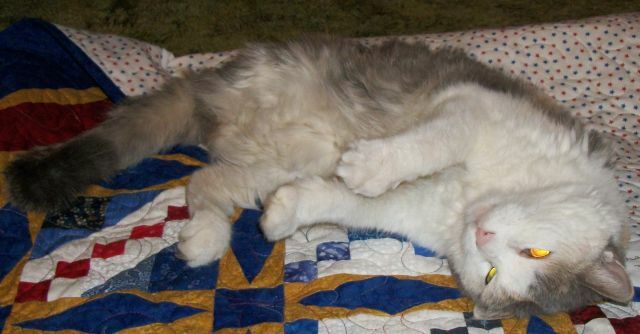 That’s when I pulled from my stash, browns, greens and beiges to make a second quilt. I got the pattern written and the 2nd quilt top made. It was then on to the quilting. Inspiration struck and I had a plan. It’s a good thing I had a test quilt as it turns out my vision and quilting skills just weren’t in-synch. Given the timeframe I had to work with, I moved on to a compromise of my vision to meet my deadline. I quilted the top at Quilted Memories using the pantograph Feather Me by Meredith England. Coats & Clark Star thread #0815 – Americana was used on the top and white pre-wound Superior Bottom Line in the bobbin. Hobbs Bleached 80/20 with scrim is the batting. For the record the blocks in the top are various red, white and blue “scraps” from my stash. 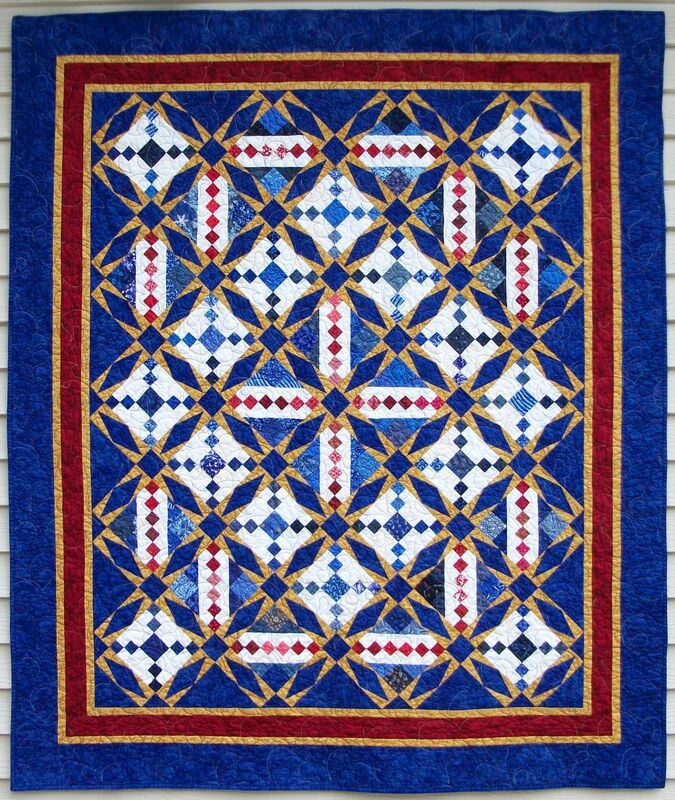 The blue cornerstones, sashing, setting triangles, border and binding is Michael Miller Krystal in Royal Blue. The gold star points and accent border is Robert Kauffman Fusions in Antique and the red border is Paula Nadelstern Holiday Luminosity Prismaglass in Red. The sashing was paper pieced and the borders are mitered. For the backing I found a length of red and blue stars on white which came from Mom’s stash. It says Signature Classics by Oakhurst Textiles on the selvage. After washing the quilt measures 57 x 67. Congratulations Pam and the publication of your pattern. I will be looking for it in “The Quilt Pattern Magazine” when I open my issue today. It is truly a beauty.